Add this shop to my favorites. Le cours entier du grand et fameux Nil.. Availability: in stock Condition : Good, general age-related toning. Some wear and minor defects, please study image carefully. 1750 Overall size : 61 x 51 cm. Image size : 59.5 x 48.5 cm. 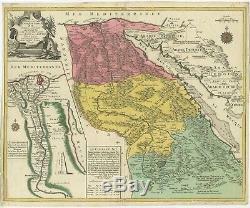 Description: Antique map Africa titled'Le cours entier du grand et fameux Nil.. Rare map of ancient Egypt. West is at the top and the Nile bisects Egypt. A inset shows modern Egypt to good detail. With the Red Sea and part of the Arabian Peninsular. Fine cartouche and detail with Pyramids, Nile waterfalls, etc. With tracks from Dereira to Jerusalem and All Zark in Arabia. Artists and Engravers: Tobias Conrad Lotter was born 1717 in Germany. He became a publisher and engraver in Augsburg. He was engaged by Matthias Seutter the elder as an engraver and married his daughter. He also was successful with his own business and became one of the better known German cartographers. After his death in 1777, the business was continued by his son Matthias Albrecht Lotter. The item "Le cours entier du grand et fameux Nil (. 1750)" is in sale since Thursday, April 11, 2019. This item is in the category "Antiques\Maps, Atlases & Globes\Africa Maps". The seller is "bartele-gallery" and is located in Langweer. This item can be shipped worldwide.